Americans do not live in a culture that values philosophy. I could go on about the deep veins of anti-intellectualism that run under the country like fault lines or natural gas deposits, but I won’t. Let’s just say that we favor more obvious displays of prowess: feats of strength, agility, and physical violence, for example, of the superhero variety. 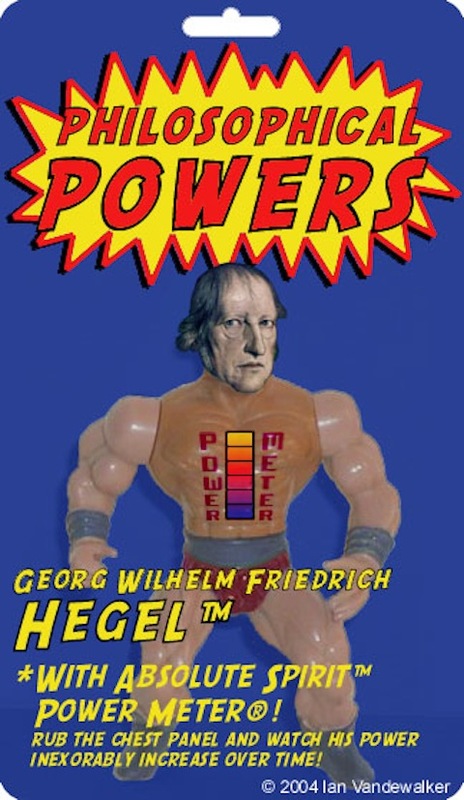 With this fact in mind, first-year graduate student Ian Vandewalker decided he “wanted to do something that would bring a discipline that is often seen as difficult, esoteric, and even irrelevant, into new light—especially in the eyes of young people.” Remembering a poster he once saw of “an action figure of Adam Smith with Invisible Hand action,” Vandewalker decided he would combine his own love of toys and philosophy into a philosopher action figure series he called “Philosophical Powers!” Here are just a few of Vandewalker’s creations, designed somewhat like professional wrestlers, with their various leagues and range of epithets. He begins at the traditional beginning, with figures of “Plunderous Plato” and “Arrogant Aristotle” (above), “The Angry Ancients.” Aristotle, known as the “peripatetic” philosopher, has only one power: “walking.” His quality is attested by a rather circular syllogism: “All Philosophical Powers figures are totally awesome. 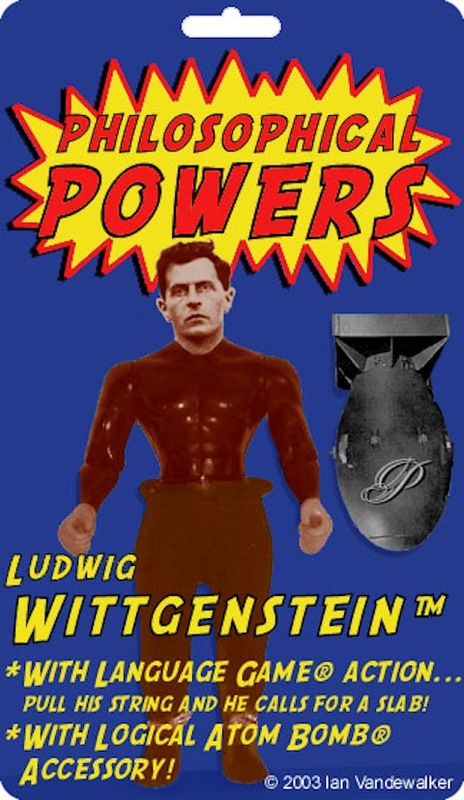 This toy is a Philosophical Powers figure. 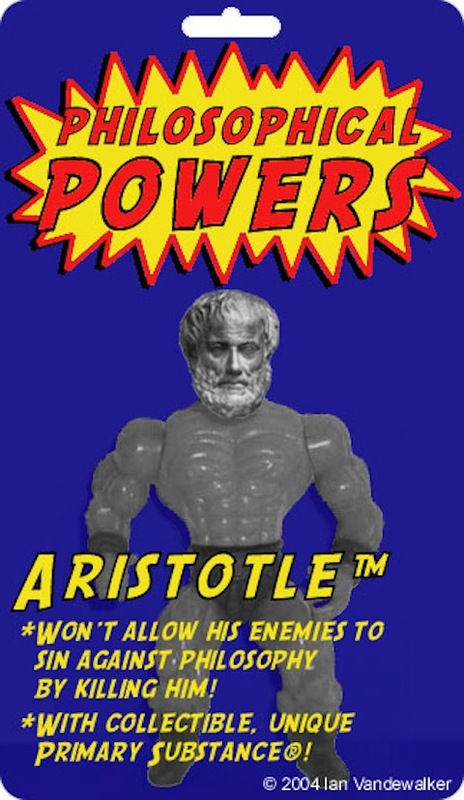 Therefore, this toy is totally awesome.” Like much of Aristotle’s deductive reasoning, the argument is airtight, provided one accept the truth of its premises. 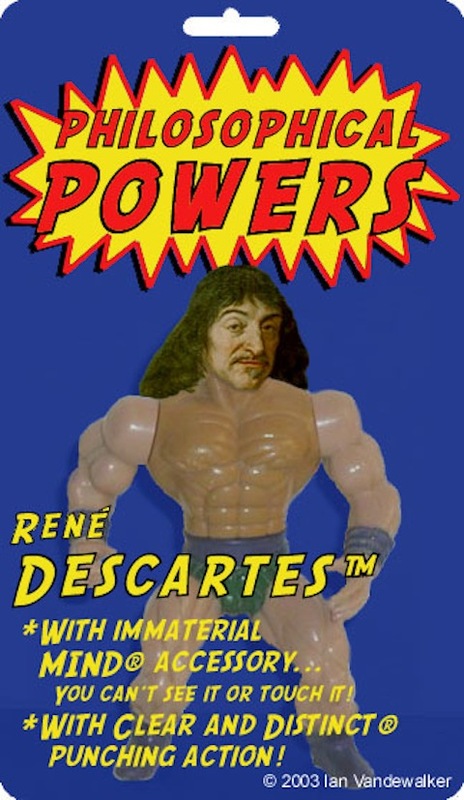 In the category of “Contumelious Continental Rationalists,” who began the revolt against those Aristotelian “Merciless Medievals,” we have “Dangerous Descartes.” René Decartes may have claimed to doubt everything—every principle that Aristotle took for granted—but he fell prey to his own errors, hence his action figure’s weakness, the “Cartesian circle.” Decartes’ method of doubt produced its own brand of dualistic certainty about his own existence as a “thinking thing,” and the existence of God, hence “certainty” is one of his action figure’s strengths. You can see the whole set at the Philosophical Powers site. It is problematic that we only get dead white men represented, but this is not solely the fault of Vandewalker but also a problem of history and the traditional academic history of ideas. One would hope that the concept is clever enough that it might make philosophy appealing to people who find it dull or unapproachable. That may be too lofty a goal, but these figures are sure to amuse the already philosophically-inclined, and perhaps spur them on to learn more. A bit like this: http://www.theory.org.uk/action.htm.